Mini Golf Tournament-2 players per team. Register in teams of two. Prizes awarded to 1st, 2nd & 3rd place teams. 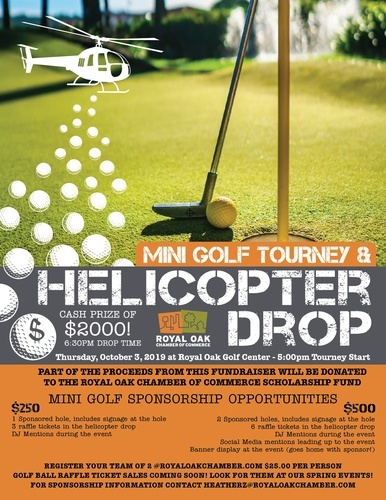 Helicopter Golf Ball Drop-Cash prize to the Winner of the ball that is closest to the pin. Golf Ball Raffle Sales to begin at our spring events. Dates and places to purchase the raffle tickets TBD. $25.00 Per Person to Golf. Includes 2 slices of pizza and unlimited fountain drinks. Register in teams of 2.